The Yas Island theme park officially opens to the public on July 25. 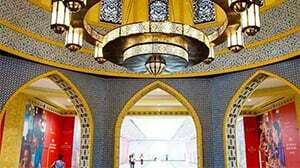 The UAE’s leaders have been given a sneak peek inside the new Warner Bros. World Abu Dhabi theme park, ahead of its public launch on Wednesday. HH Sheikh Mohammed bin Rashid Al Maktoum, vice president of the UAE and ruler of Dubai, joined Abu Dhabi Crown Prince HH Sheikh Mohamed bin Zayed Al Nahyan in opening the billion-dollar theme park on Yas Island. Never one to pass up a fun opportunity, HH Sheikh Hamdan bin Mohammed bin Rashid Al Maktoum, Crown Prince of Dubai, came along to check it out, too. The royals were accompanied by some young friends as they toured the 1.65 million square foot indoor park, which features 29 rides and attractions themed around characters and stories from DC Comics and entertainment studio Warner Bros. The VIP guests also got to see the first screening of the Warner Bros. Cinema Spectacular – a one-of-a-kind show that brings Warner Bros.’ film library to life. The park is spread across six zones; Metropolis, Gotham City, Cartoon Junction, Bedrock, Dynamite Gulch and Warner Bros. Plaza. Within each zone, you can watch live performances and meet with beloved characters like Scooby Doo, Superman and Wonder Woman. Tickets to the new theme park are priced from Dhs295 for adults and Dhs230 for children.